Traction spurs, which are also known as traction osteophytes or non-marginal osteophytes, are bone spurs that form near the vertebral endplate, according to the website Radiopedia. Radiopedia says these formations can be noted on an x-ray about 2 – 3 millimeters away from the endplate. When traction spurs are small, they tend to be associated with degenerative disease, especially degenerative disc disease and/or spondylosis. They may indicate spinal instability, Radiopedia says. Biely, et. al. in their article entitled, "Clinical Instability of the Lumbar Spine: Diagnosis and Intervention," published in the Vol 18 issue of Orthopaedic Practice lists traction spurs as one of the signs on an x-ray that may indicate instability in the support subsystem (which is comprised of your spinal column and its ligaments) of your spine. FYI, there are 3 subsystems in all, and they interact together to stabilize your spine. 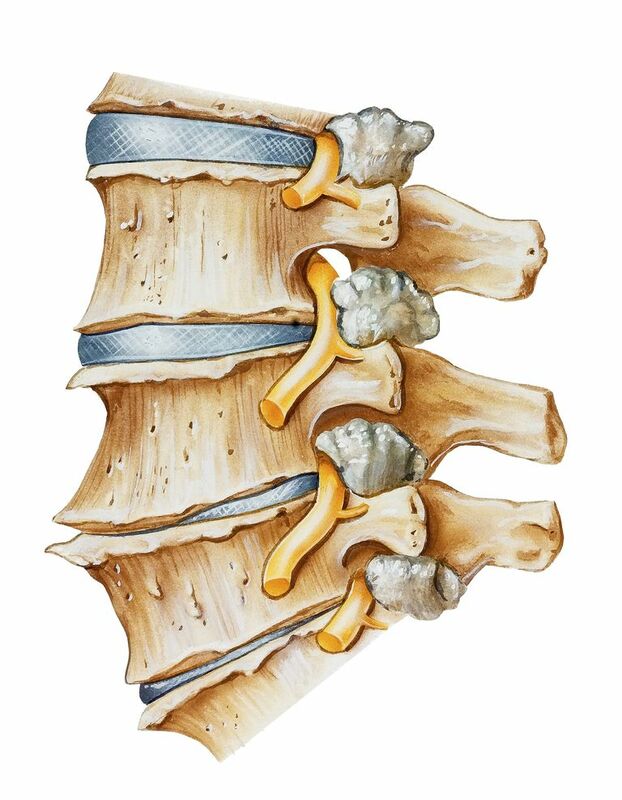 Radiopedia also says that larger non-marginal spurs are often a result of a fusion between a non-marginal and either a marginal or non-marginal spur from a neighboring vertebral endplate. This type of traction spur may indicate that inflammatory processes are at work. Traction osteophytes are actually the less common of two types that develop on the vertebral end plate. The more common variety is the claw osteophyte. Both claw and traction osteophytes have the same type of tissue and come about by the same degenerative process. To better understand degenerative changes in the lumbar spine, Kasai, et. al., reviewed almost 3000 patient x-rays. All patients in the study were over 60 years of age. The researchers paid careful attention to the front (called anterior) of the vertebral bodies. Their study was published in 2009 in BMC Musculoskeletal Disorders in an article entitled, "Direction of the formation of anterior lumbar vertebral osteophytes." Group A had no osteophytes. Group B, the spurs extended towards the nearest disc. From the side view it sort of looks like they are pointing to the intervertebral disc. In Group C, an upper/lower pair of osteophytes pointed towards each other to such an extent that they formed a nearly complete bone bridge along their shared intervertebral disc. In Group D, the upper/lower osteophyte pair pointed away from one another. In other words, the top one pointed up and the bottom one pointed down. In Group E, the osteophytes ran nearly parallel to the top and bottom lines of the disc/vertebral end plate. Holland, M. Non-marginal Osteophyte. Radiopaedia.org website. Kasai, Y., Kawakita, E., Sakakibara, T., Akeda, K., Uchida, A. Direction of the Formation of Anterior Lumbar Vertebral Osteophytes. BMC Musculoskeletal Disorders. 2009. Biely, S., P.T., D.P.T., O.C.S., M.T.C., Smith, S., P.T., PhD., Silfes, S., P.T. Ph.D. Clinical Instability of the Lumbar Spine: Diagnosis and Intervention. Orthopaedic Practice Vol. 18.